November 30, 2016 – Pluto’s “icy heart” is a bright, two-lobed feature on its surface that has attracted researchers ever since its discovery by the NASA New Horizons team in 2015. 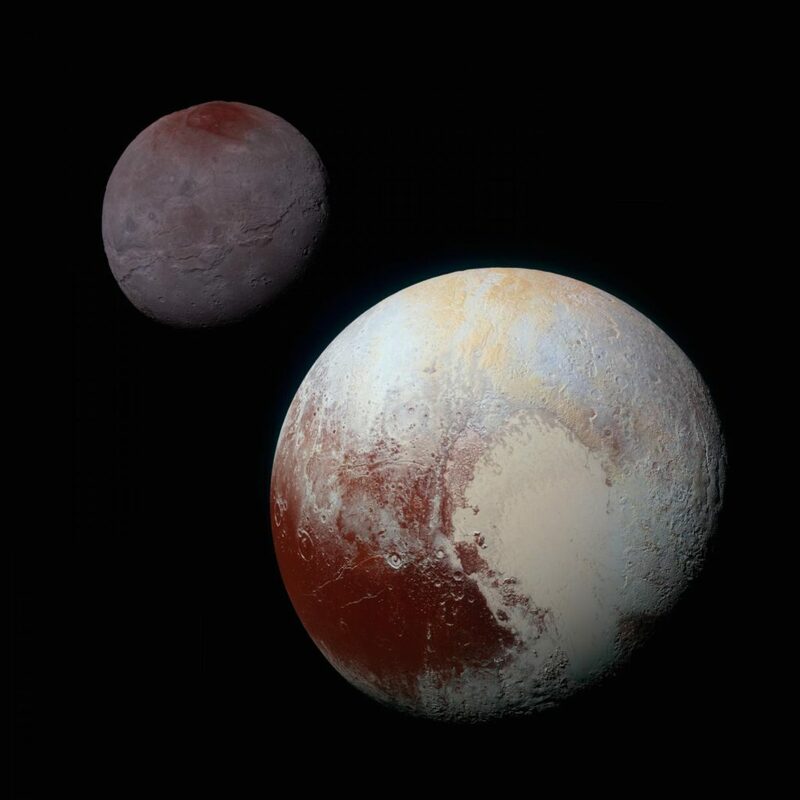 Of particular interest is the heart’s western lobe, informally named Sputnik Planitia, a deep basin containing three kinds of ices — frozen nitrogen, methane and carbon monoxide — and appearing opposite Charon, Pluto’s tidally locked moon. Sputnik Planitia’s unique attributes have spurred a number of scenarios for its formation, all of which identify the feature as an impact basin, a depression created by a smaller body striking Pluto at extremely high speed. A new study led by Douglas Hamilton, professor of astronomy at the University of Maryland, instead suggests that Sputnik Planitia formed early in Pluto’s history and that its attributes are inevitable consequences of evolutionary processes. The study will be published in the journal Nature on December 1, 2016. Using a model he developed, Hamilton found that the initial location of Sputnik Planitia could be explained by Pluto’s unusual climate and its spin axis, which is tilted by 120 degrees. For comparison, Earth’s tilt is 23.5 degrees. Modeling the dwarf planet’s temperatures showed that when averaged over Pluto’s 248-year orbit, the 30 degrees north and south latitudes emerged as the coldest places on the dwarf planet, far colder than either pole. Ice would have naturally formed around these latitudes, including at the center of Sputnik Planitia, which is located at 25 degrees north latitude. Although Pluto was stripped of its status as a planet, an ice cap is a surprisingly Earth-like property. In fact, Pluto is only the third body — Earth and Mars being the others–known to possess an ice cap. The ices of Sputnik Planitia may therefore offer hints relevant to more familiar ices here on Earth. The research paper, “The rapid formation of Sputnik Planitia early in Pluto’s history,” Douglas P. Hamilton; S. A. Stern; J. M. Moore; L. A. Young; and the New Horizons Geology, Geophysics & Imaging Theme Team, will be published in the journal Nature on December 1, 2016.